An Israeli inventor has developed an underwater breathing system that literally squeezes oxygen directly from seawater, doing away with the need for compressed air tanks. Called “LikeAFish”, the battery-powered artificial gill system aims to extract the small amounts of dissolved air that already exists in water to supply breathable oxygen to scuba divers, submarines and underwater habitats. 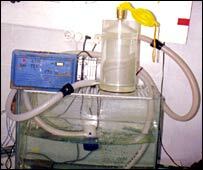 the re-breather for a diver….. but its greatest potential could lie in underwater habitats. Flap over fishes: Whos the smallest of them all? Flap over fish: Who’s the smallest of them all? A 6.2 mm long male Photocorynus spiniceps, fused to the middle of the back of a 46 mm long female. 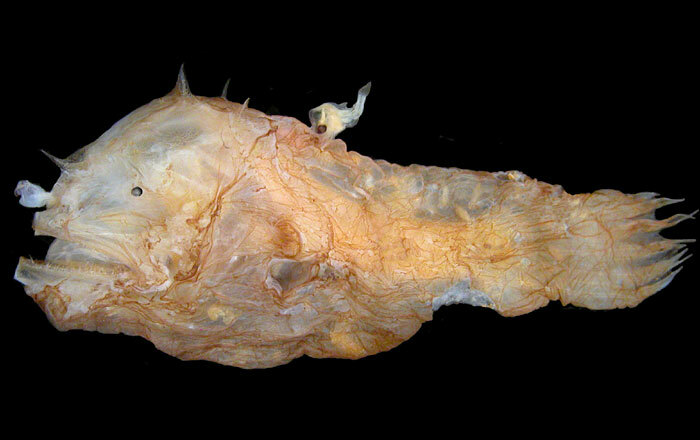 The authors of a paper in this week’s Proceedings of the Royal Society of London Section B, who say their 7.9 mm-long fish from a peat swamp in Southeast Asia is the smallest fish and vertebrate known (see here), have failed to make note of work published last autumn that describes sexually mature, male anglerfish measuring 6.2 mm to 7.4 mm in length. 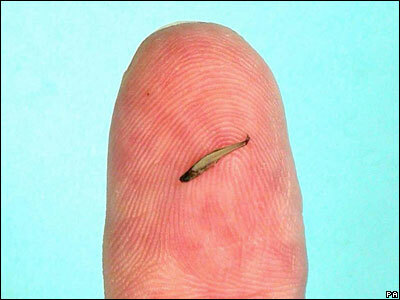 The 6.2 mm specimen is by far the smallest of any vertebrate, beating the recent claim by a full 1.7 mm, according to Ted Pietsch, a University of Washington professor of aquatic and fisheries sciences, who has described the specimen. The male is attached to the middle of the back of a 46 mm long female Photocorynus spiniceps – that is how they mate. It’s called sexual parasitism – the males are tiny compared to the females and fuse for life to their mates by biting onto the sides, backs or bellies of a female. An attached male provides the female with everything she needs to reproduce. For the task, the 6.2 mm male, for instance, has testes so huge they nearly fill his entire body cavity, crowding his other internal organs. The female takes care of swimming, eating – everything. 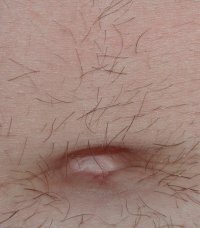 Dr Karl Kruszelnicki, the man responsible for demystifying belly button lint, has been awarded an Australia Day Honour for his work as a science communicator. Kruszelnicki describes himself as “very mediocre as a scientist but pretty good at talking about it”. Human societies rapidly descend into anarchy and chaos without policing. Now, researchers have found that the same thing happens when groups of monkeys are left to their own devices instead of being “policed” by dominant males. When three of four dominant males were removed simultaneously from a captive group of 84 pigtailed macaques at the Yerkes National Primate Research Center group cohesion rapidly began to disintegrate. The researchers saw cliques forming and the breakdown of social networks and contact through communal activities like playing, grooming and sitting together. The amount of violence also escalated, with no one to broker the peace. “We tend to associate power with privilege, but both in human and animal society it also entails a constructive contribution, or at least ought to. Through their stabilising presence and active peacekeeping, the dominant males contribute to a more cooperative society.” – Frans de Waal. Scientists have discovered the smallest known fish on record in the peat swamps of the Indonesian island of Sumatra. Mature individuals of the Paedocypris genus can be as small as 7.9mm (0.3in) long! To keep their size down, the fish have abandoned many of the attributes of adulthood – a characteristic hinted at in their name. Being so small, the fish can live through even extreme drought, by seeking refuge in the last puddles of the swamp. 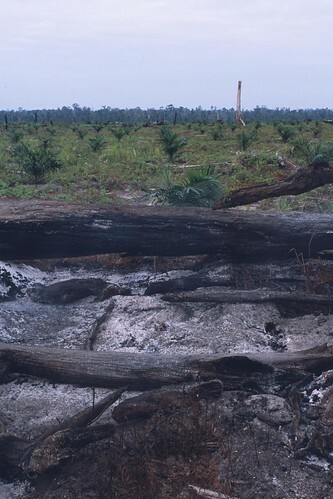 Scientists warn long-term prospects for the fish are poor, because widespread forest destruction, drainage of the peat swamps for palm oil plantations and persistent fires are destroying their habitat. I found this site during a search for some orangutan information. It looks like this production company is doing its best to make known the devastating effects of the demands for palm-oil. Be sure to visit their blog (link on the page) and Nick Lyon’s excellent photos. The dramatic collapse of orangutan populations has been linked to human activity, new genetic evidence shows. Microbes are living archives of Earth’s evolutionary history. The discovery of a great variety of deep-sea microorganisms (using diverse metabolic strategies to live in diverse habitats) indicates that they evolved along different evolutionary pathways. Using genetic analyses, scientists can trace these pathways to reconstruct when various microbial biochemical and metabolic machinery developed, diverged, or intermingled in the three major domains of life: bacteria, archaea, and eukaryotes. I dug this out after KingBoy sent me this interesting article: From bacteria to us: What went right when humans started to evolve? *I don’t know why I kept the original title. I really don’t like it. Growing a home from living trees instead of building a home from felled timber is the goal of an architect from MIT. 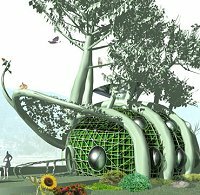 The Fab Tree Hab goes beyond sustainable housing and so-called green design, building with materials that have a low impact on the environment and human health. It is based on an ancient gardening method known as pleaching, which weaves together tree branches to form living archways, lattices or screens. Rumdoodle asks: Why not bamboo?